The following post was sent to NottinghamMD.com by a member of the PHHS Alumni Association. 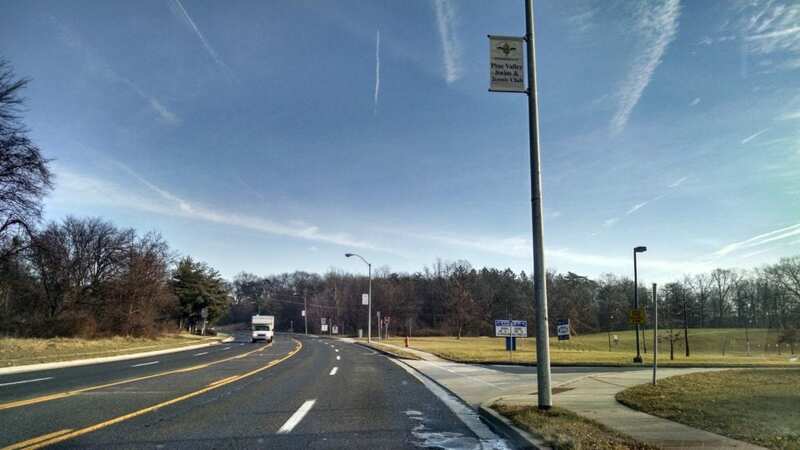 The Perry Hall High School Alumni Association Board is happy to announce that the second batch of PHHS Banners was placed on Honeygo Blvd. this past weekend. 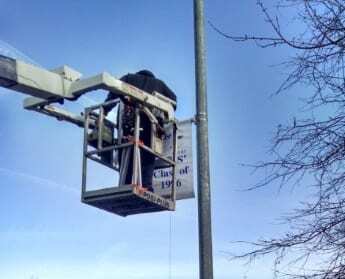 Accent Printers of White Marsh, MD was able to get a rental bucket truck for this past weekend. The bucket truck that they had for the 1st batch of Banners broke down and apparently their other connections for rental bucket trucks weren’t available either unfortunately. Such is life though sometimes. This experience has definitely been a trial & error process for all involved, as Assistant Principal Stephen Arnold & PHHS did everything for the school’s 50th Celebration Banners that were up a few years ago. It was PHHS’s Alumni Association Board’s 1st time organizing it all, the Artist’s (Jeremy Grande) 1st time designing a PHHS Banner (of which everyone seems to love his design), and Accent Printers 1st time creating and placing PHHS Banners. Even though getting all of the PHHS Banners up on the light poles took a bit longer than expected, this has been a wonderful fundraiser for Perry Hall High School. Therefore the Perry Hall High School Alumni Association Board Members would like to publicly thank the banner owners for their patience during this learning process, and for their support of PHHS. Of course we also must thank Principal Last and everyone else at Perry Hall High School for their input and support, as always. We thank Jeremy Grande (a PHHS Alumnus) very much for volunteering his artwork for the new Banner Design. We especially thank Dan Meyler (a PHHS Alumnus & Owner of Accent Printers) and Fred White of Accent Printers for creating and placing over 100 PHHS Banners on Ebenezer Rd. and Honeygo Blvd., as there’s been some blood, sweat, tears, and unforeseen expenses that they’ve put into this project as a team. Last but definitely not least, we thank Baltimore County Councilman David Marks and everyone else that’s been involved from Baltimore County who have allowed us to conduct this fundraiser. Without the support of those involved at Baltimore County, the PHHS Banner Fundraiser wouldn’t have been possible. The Perry Hall Alumni Association again thanks everyone who’s supported the said fundraiser for PHHS. Since we’ve worked out all of the kinks, we look forward to the 2018 – 2019 school year’s Banner fundraiser for PHHS as it should be a quick and smooth process. For the 2017 year, we’re looking forward to working with the other organizations of PHHS on new fundraisers and projects for Perry Hall. One such project is the PHHS Athletic Boosters’ fundraiser for a Turf Field at Perry Hall High School. The Members of the PHHS Alumni Association Board hope that everyone has a happy & healthy New Year.